Decades ago, Albert Einstein had doubted that his theory of general relativity could be used to calculate the weight of a star. Astronomers measured the effect of white dwarf Stein 2051B on the light of a more distant star. Albert Einstein himself believed it couldn't be done. A few decades after he published his theory of general relativity, a colleague asked the famous physicist whether the concept could be used to calculate the weight of a star. Theoretically, yes, was his reply. If one star passed in front of another, the closer star's mass would distort the light of the star behind it. A savvy scientist could then figure out how much the forward star weighed by measuring the degree of that distortion. But good luck actually trying to do this experiment. "There is no hope of observing this phenomenon directly," Einstein wrote in a December 1936 issue of the journal Science. He doubted that two stars would ever line up so perfectly. And even if they did, it was beyond the capability of the era's best telescopes to bring such an event into focus. That may have been true 80 years ago. But Einstein had no way of knowing that people would one day build a telescope so powerful it can see galaxies in the making 10 billion light-years away, or that we would launch this instrument into space. With the Hubble Space Telescope, astronomers had a hope of proving Einstein right about light bending but wrong about our inability to see it. 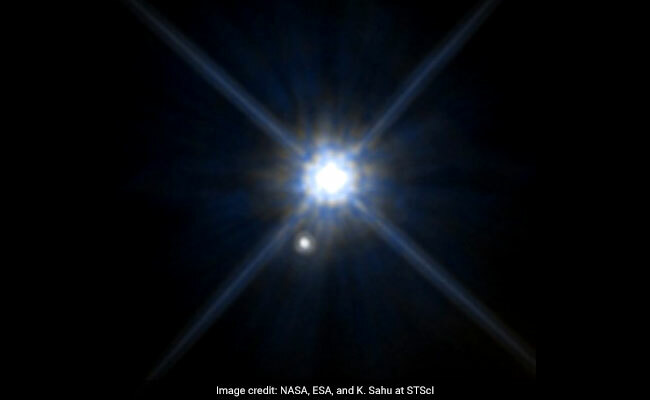 The stars finally aligned in March 2014, when Stein 2051B, a white dwarf about 18 light-years from Earth, passed in front of a more distant background star. White dwarfs are the cooling remnants of dead stars - extremely dense spheres of matter that form when a star has run out of fuel for nuclear fusion and collapses. As predicted by Einstein's theory, the gravity of a massive object like Stein 2051B makes the star act like a lens, bending the light that passes by it. This effect, called gravitational lensing, is minuscule. Stein 2051B appears 400 times as bright as the background star (which is 5,000 light-years from Earth), so measuring the deflected light is as difficult as detecting a firefly hovering near a lightbulb from 1,500 miles away. 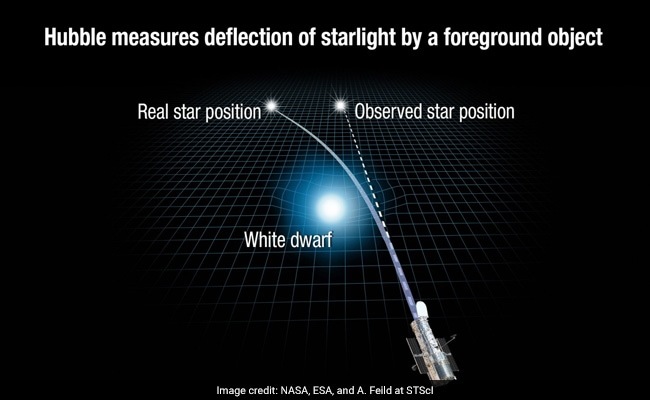 This illustration reveals how gravity of a white dwarf star warps space. But Hubble was up to the challenge. When Stein 2051B eclipsed the background star, gravitational lensing made the background star appear to move by milliarcseconds (the unit used to measure distance in space). The researchers used this tiny deflection to calculate that the mass of Stein 2051B is about 68 percent the mass of our sun - or 1.4 octillion tons (that's 14 followed by 26 zeros). Their results were published in Friday's issue of the journal Science, (81 years after Einstein wrote in the same journal that such a feat was impossible) and presented at an American Astronomical Society meeting last week. Poetically, it was this same phenomenon - gravitational lensing - that first demonstrated the validity of general relativity almost 100 years ago. In 1919, just two years after Einstein published his theory, astronomers used the apparent movement of stars around the sun during a total solar eclipse to determine that massive bodies like the sun do warp space-time, causing light to bend. A century later, even the most outlandish-seeming aspects of Einstein's theory are still being proved right: the expansion of the universe and gravitational waves. Aside from offering a rare opportunity to contradict Einstein, the study of Stein 2051B offered important insight into the physics of white dwarf stars. They are the "fossils" of the universe, astrophysicist Terry Oswalt wrote for Science, and like fossils, they offer important insight into the evolution of stellar generations past. In 1935, Nobel Prize-winning astronomer Subrahmanyan Chandrasekhar predicted that the mass of a star as it died would determine whether it collapsed into a white dwarf or evolved into a different kind of stellar remnant - a neutron star or black hole. Previously, the mass of a white dwarf could only be measured if it orbited close to another star, allowing scientists to gauge the celestial bodies' gravitational influence on one another. Calculating the effects of gravitational lensing lets astronomers measure the mass of any white dwarf they can find.